Anxiety is a normal reaction to stress, and can actually be beneficial in small doses because it acts as a survival instinct, making you acutely aware of your surroundings. However, anxiety in excess, becomes a disorder. This is described as a psychological state that is characterized by the overwhelming, constant feelings of worry, even when there is seemingly nothing to provoke these feelings. Anxiety symptoms can range from mild to severe, affecting the ability to carry out simple daily tasks. It is important to try different treatments to find out which one works best for you. The leading cause of anxiety disorders in women is hormone fluctuations experienced during menstruation, pregnancy, and menopause. Other factors that can trigger anxiety symptoms include excessive stress, genetics, certain medications, emotional trauma, lack of exercise, and poor diet. Anxiety symptoms can be categorized into either physical or psychological. Physical symptoms can include sweating, dizziness, increased heart rate, shortness of breath, muscle tension, insomnia, and headaches. Psychological symptoms can be anything from feelings of intense fear and restlessness to irritability and anticipating disaster. Follow these treatments to find anxiety relief. Making simple dietary changes can be extremely helpful in reducing anxiety symptoms. Try including plenty of protein, fiber, omega-3 fatty acids, and fruits and vegetables into meals for maximum energy and concentration levels. Salmon, spinach, apples, almonds, and low-fat yogurt are all healthy foods that have been known to help ease anxiety. Avoid skipping meals to prevent anxiety symptoms, like irritability and headaches. The most effective way to reduce stress and release mood-promoting neurotransmitters, like serotonin and endorphins, is to exercise regularly. This means at least 30 minutes of aerobic activity daily, five times a week. Exercising can also significantly increase energy levels, lift mood, and improve sleep. Going for a walk, riding a bike, and swimming laps are all good forms of low-impact workouts that can help lessen anxiety. Herbs with sedative qualities can help ease anxiety symptoms, calm the nerves, and soothe restlessness. Chamomile, lavender, hops, valerian, lemon balm, and passion flower are all calming herbs that are widely used for treating anxiety disorders. These herbs may be taken in supplement or extract form, like capsules, teas, and tinctures. Taking time every day for yourself is key to feeling good and treating anxiety. Taking a yoga class, having a soothing bath, reading, and meditating are all effective ways to relax the body and mind after a long day. If none of these natural treatments work for you, it may be time to seek professional help. A healthcare professional can help determine what type of anxiety you are experiencing and decide if talk therapy or prescription medication - or a combination of the two - is the best treatments for you. Anxiety disorders can range from mild to severe and interfere with your ability to carry out every day activities. On average, anxiety affects 40 million Americans, occurring twice as often in women than in men. There are many natural treatment options that have been shown to be beneficial. 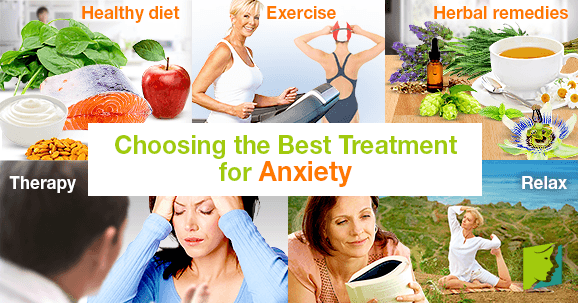 Talk therapy and prescription medication are another alternative to treating anxiety. It is important to try and find the treatment option that works best for you.